2013 marked the fourteenth and final season for the Grand American Road Racing Championship. As was the tradition, the twelve-race season opened in Daytona with the Rolex 24. The remainder of the schedule included some changes from the previous year. Circuit of Americas, Kansas Speedway and Road Atlanta were added and Homestead-Miami, Circuit Gilles Villeneuve, New Jersey Motorsports Park and the second Watkins Glen event were dropped from the schedule. Most races were 250-miles in length with a 2-hour and 45-minute time limit. The major exceptions were the 24-hour event at Daytona, Sahlen’s Six Hours of Watkins Glen and the Brickyard Grand Prix which was 3-hours. Daytona Prototype (DP) – These sports racing cars were designed to compete in the Grand Am series. The concept of an affordable prototype for privateer teams was introduced in 2003. Rules were created so that the cars could be produced for less than $400,000. Additionally, the prototypes had to be approved by the series and new cars could not be introduced for 5-years. The flat-bottomed, closed cockpit prototype was constructed with a complete frame and a mid-engine location. The cars were powered by motors from production cars. Manufacturers providing engines included: Chevrolet, Ford and BMW. 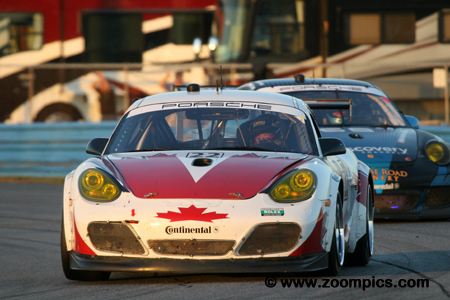 The 2008 season saw the introduction of the Generation 2 Daytona Prototypes and there were additional changes allowed in 2012 which resulted in Gen 3 cars. Grand Touring (GT) – After a number of seasons with multiple GT classes a single category was introduced in 2005. The GT division was for production-based vehicles. Cars racing in this group included the: Audi R8 Grand-Am, Ferrari 458 Italia, Porsche GT3 Cup, Chevrolet Camaro GT.R, Dodge Viper, BMW M3, Mazda RX-8 and Chevrolet Corvette. To equalize performance among the different brands, rules were implemented that included adjusting the vehicle’s weight, limiting tire size and engine RPMs. GX – This class was introduced in 2013 for alternative fuel vehicles. Two manufacturers were represented by vehicles in this category: Porsche Cayman S and Mazda 6 SKYACTIV. 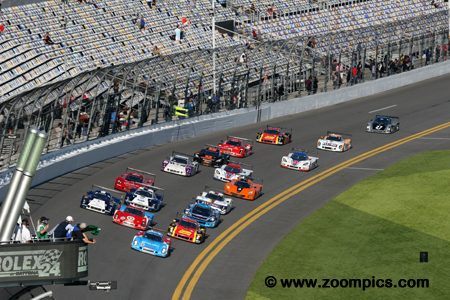 The 51st annual Rolex 24 at Daytona took place on the weekend of January 26 and 27. There was a total of 56-starters (17 in DP, 33 in GT and 6 in the new GX class). Drivers would compete for 24-hours on the twelve-turn, 3.56-mile track which utilized an infield road course and almost the entire tri-oval. A thirty-one lap caution period, lasting approximately two hours, for fog meant the overall winner completed fewer circuits (709-laps) than achieved in 2012 (761-laps). The start of the 51st running of the Rolex 24 Hours at Daytona. Using a split start, fourteen Daytona Prototype entries receive the starters green flag first and are followed by thirty-nine GT and GX cars. 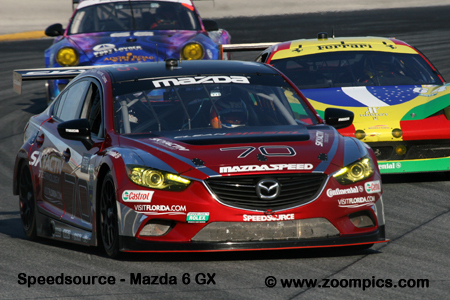 The first retiree, after thirty laps, was the Mazda 6 GX class entry of Visit Florida Racing / Speedsource / Yellow Dragon Motorsports. It was a dominant race for the No. 01 entry of Chip Ganassi Racing with Felix Sabates. 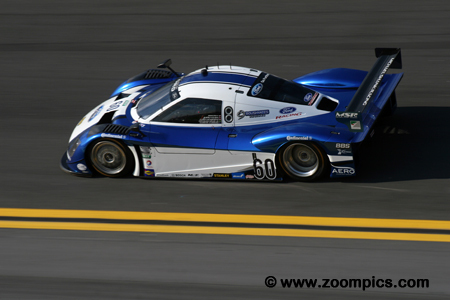 Lead driver, Scott Pruett, qualified on the overall and Daytona Prototype pole. Pruett and co-drivers Memo Rojas, Juan Pablo Montoya and Charlie Kimball, led 421 of the 709-laps completed. The victory was Pruett’s fifth and tied the record held by Hurley Haywood. Nick Tandy driving the Franz Konrad Porsche 911 GT3 Cup was the fastest Grand Touring class qualifier. Tandy shared the car with Michael Christensen, Christian Engelhart and Lance Willsey. He led the category for the first six laps before being passed by Andy Lally in the Magnus Racing Porsche. The Konrad Motorsport entry would encounter problems early and retired on lap-181. With less than an hour to go in the race, Max Angelelli found himself in the lead driving the No. 10 Velocity Worldwide Corvette DP. Unfortunately, for Angelelli and his teammates – Jordan Taylor and Ryan Hunter-Reay - he was passed on lap-106 by Juan Pablo Montoya in the class winning Daytona Prototype of Chip Ganassi Racing. The trio who started from the twelfth grid position would hold on to finish second overall and in Daytona Prototype. The new GX class for alternative fueled cars was won by the No. 16 Napleton Porsche Cayman S. The car which was shared by David Donohue, Shane Lewis, Nelson Canache Jr. and Jim Norman, started first in class and fifty-second overall. A steady performance by the team and drivers allowed them to lead 617-laps - by comparison, their competition led a total of 18-laps. 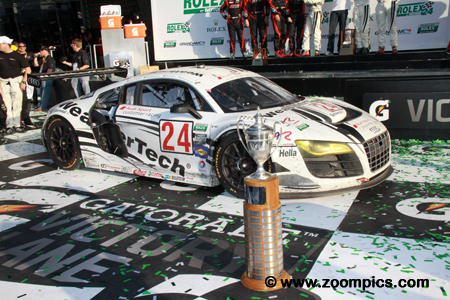 The class winning GT Audi R8 Grand-Am is parked in Victory Circle. Audi driver, Filipe Albuquerque was given the task of making up a one-lap deficit in his final stint. In the last forty-minutes of the race, he took the lead when the AIM Autosport Ferrari pitted. Driving every lap like it was qualifying, Albuquerque finished ninth overall and shared the class victory with his teammates – Oliver Jarvis, Edoardo Mortara and Dion von Moltke. The second entry in the Chip Ganassi Racing stable was the No. 02 BMW Riley - driven by Scott Dixon, Dario Franchitti, Joey Hand and Jamie McMurray. This group of drivers led the race for a combined total of 116-laps. With just over 3.5-hours left in the contest, Franchitti stopped on track with a driveline issue which brought out the event’s fourteenth caution. The car did not return to the track and finished thirty-seventh overall. Audi Sport Customer Racing had three factory-supported Audi R8 Grand-Am entries. The No. 52 Audi from the British company APR Motorsport Limited was one of the three factory Audis. It was driven by Frank Stippler, Rene Rast, Ian Baas and Marc Basseng and started from the twenty-seventh grid position. After twenty-four hours, the team was tenth overall and second in the Grand Touring class. Team Sahlen was managed by the Nonnamaker family who had many years of endurance racing experience in Showroom Stock and Grand Touring categories. In 2013, the team transitioned to the Sports Racing class entering two Daytona Prototype Riley’s powered by BMW engines. At Daytona, the No. 42 car started third with drivers – Wayne Nonnamaker, Dane Cameron and Simon Pagenaud and finished ninth in class after problems with an input shaft. Michael Shank Racing were the defending Rolex 24 Champions. Driving a Riley powered Ford, drivers John Pew, Oswaldo Negri Jr., A.J. Allmendinger, Justin Wilson and Marcos Ambrose started from the sixth grid position. The team finished third overall and in the Daytona Prototype category and were the last car to finish on the lead lap. 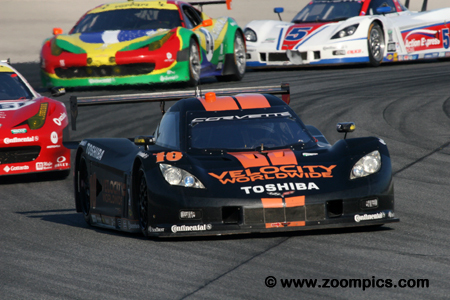 The reigning Rolex 24 GT class champions were the Magnus Racing entry. This year the driver line-up included John Potter, Andy Lally, Richard Lietz and a new addition, replacing Rene Rast, Nicolas Armindo. As usual, their Porsche GT3 Cup was quick – Andy Lally qualified on the outside of the front row. At the finish, they could boast about being the highest placed Porsche but this was only good enough for fifth in the Grand Touring class. 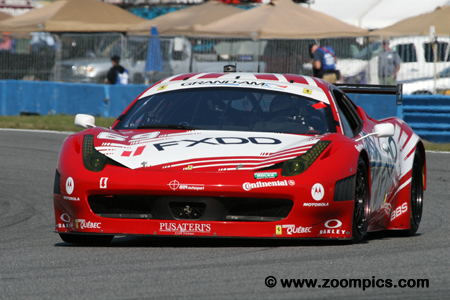 In 2012, open wheel and Daytona Prototype veterans, AIM Autosport prepared a Ferrari 458 for Grand Touring competition. The team had early success, scoring their first victory in round three at Homestead-Miami. Driving the car at the Rolex 24 was Emil Assentato, Nick Longhi, Anthony Lazzaro and Mark Wilkins. The Ferrari started ninth and was leading when passed by the No. 24 Audi R8. At the finish, they were third in GT and eleventh overall. Finishing second in the new GX class was the Bullet Racing Porsche Cayman S. The Porsche was shared by Darryl O’Young, Daniel Rogers, James Clay, Seth Thomas and Karl Thompson. 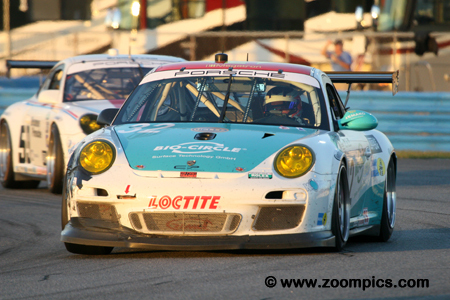 In qualifying, the Bullet Porsche started last but their perseverance was rewarded with a podium finish. 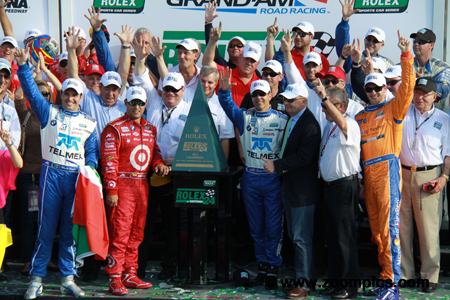 The Chip Ganassi Racing team celebrate their fifth win on the victory podium at the Rolex 24. Team owner, Chip Ganassi is surrounded by the crew and drivers – Scott Pruett, Memo Rojas, Charlie Kimball and Juan Pablo Montoya. This was the team’s fifth victory in ten starts.